← Twas a great weekend . . .
Do you have quinoa cooked up? If not, cook some quinoa. Cut acorn squash in half and scoop out seeds. Place cut-side down in a baking dish with a few tablespoons of water. Bake at 350-400 degrees F (temperature is flexible and can be set to accommodate other things you’re baking at the same time) until the squash is tender (20-30 minutes?). After the squash is in the oven, chop some onions, garlic, and bell peppers (you can toss in almost any veggie you like here). Saute in olive oil, then remove from heat and stir in the cooked quinoa. Add dried fruit — I used golden raisins, but cranberries would be good. Season to taste with salt and pepper. When squash is tender, turn them over and fill the squash “bowls” with the quinoa mixture. Top with toasted almonds and bake for 5-10 more minutes. 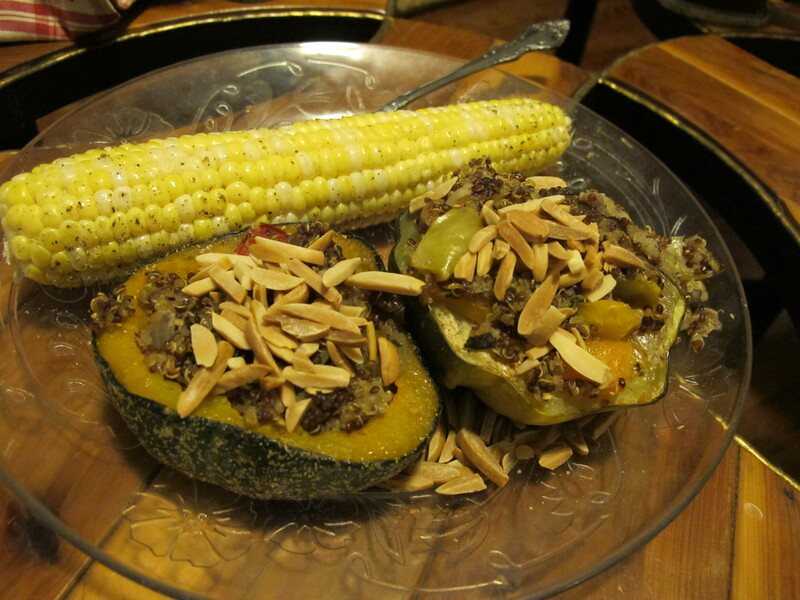 This entry was posted in Food, Recipes and tagged acorn squash, vegan, vegetarian recipes. Bookmark the permalink. That looks delicious! I may have to try that – seems perfect for fall. It was a pretty tasty creation, though highly dependent on the flavor of the acorn squash. Two of the squash were so-so, but the other two were amazing! Fortunately, we saved those two for last (i.e., the leftovers), so it was quite a pleasant surprise 🙂 Unfortunately, I don’t know that there’s any way to tell ahead of time how the squash will taste.